Promotes your immune system, joint function and digestion. spice because of its extremely wide ranging health benefits.) Turmeric’s anti-inflammatory properties not only reduce pain when you’ve pushed yourself to hard, they help promote healthy joint function. 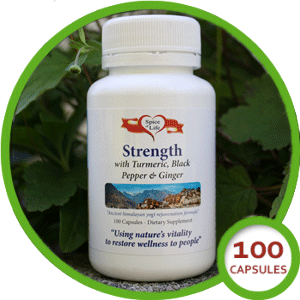 The super spice’s effect of promoting healthy cell growth (strengthening the walls of your body’s cells), as well as its ability to slow unhealthy cell growth, enables Strength to improve the effectiveness of your immune system. Your digestive system doesn’t get left out when it comes to the benefits of turmeric. Gas, bloating and indigestion can all be reduced by turmeric and regular consumption may reduce the chance of them happening in the first place.